Next to common grammatical errors, like spelling mistakes (alot vs. a lot) and misused words (loose weight vs. lose weight), punctuation is often overlooked, but it shouldn’t be. You can harness this power to attract new readers and keep your current readers engaged with the free Top Punctuation Howlers PDF guide. Unlike other style guides that imprison your writing or as one author put it, cause you to “type on eggs,” Top Punctuation Howlers is easy to understand with its plethora of examples and open-writing style recommendations. Instantly download your FREE copy of the Top Punctuation Howlers here! Now that you’ve downloaded the Top Punctuation Howlers PDF, increase exposure and leverage your authority by building your dynamic and engaging article portfolio. Combine one, two, three – or all seven – Build Your Own Article Template Packages to find the perfect combination of article topics and framework to suit you and your audience. Click here to start building! I’ve always found punctuation a little intimidating, this PDF is right on time. That is brilliant, Penny. Love the “woman without her man”. Am inclined to the female point of view even though male. Another great post, thank you. To me is correct, some sentences don’t need too much punctuations, what matters…we the understand it? Insightful and communicative and professional looking and appitaising [appetizing] write-up. That’s a superb punch line….and awesome article too. Princely, you just don’t understand Penny’s point. The sentence is completely different with the different punctuation. From the female point of view a man is nothing without his woman; from the male point of view a woman is nothing without her man. Punctuation is everything in this sentence and you can’t say that you understand it unless you can appreciate the difference between the two sentences with the same words but different punctuation. 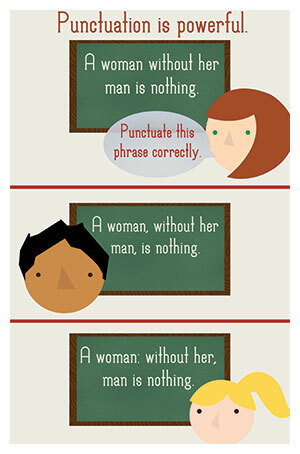 Loved the example about the power of punctuation -“A woman: without her, man is nothing.” . However, inserting the commas in “A woman, without her man, is nothing,” is incorrect. That sentence reads correctly without the commas as it is a restrictive (as opposed to a non-restrictive) clause. We need the information “without her man” to understand which woman we are talking about. Michelle. You are correct that the sentence reads as good English without the commas but punctuation is also used for emphasis. Helena, who is a stunning beauty, is married to Edmund. That was an absolutely a brilliant example. I am going to implement that into my statement classes immediately. Edmund, I thought so. Adding to that, I believe that any person reading this; will understand it as a man or as a woman. It’s natural. If a man reads it, he’ll make himself more important- vice versa. the men reading this, will say, YES! To that which concerns women, vice versa. Punction is a very difficult thing. People don’t care about them- Sometimes. They just want to understand what your say. Just that a well punctuated article looks good and neat. What interests me most are in the way the message is to come across, depend upon the story… Whether or not it is in UK, or US English. The norm is confusing; however, if grasped, can add layers to our personality. More discussion on this subject is very welcome. Edmund, it’s true that punctuation is used for emphasis, but that emphasis needs to be punctuated correctly. Considering that the article focuses on the correct use of commas, the examples given should not perpetuate its incorrect use. “… can add layers to our personality.” Huh. Am sorry! I didn’t mean to… I thought, I was using an available example to illustrate, feelings of people [some] to things- the natural perspective. and to tell myself that, Penny meant well to writers, in the article: Empower Your Writing With The Top Punctuation Howlers Grammar Style Guide. Thanks, It is about time I understood American English punctuation, everyone complains about my lack of it. I still make mistakes with punctuation errors… especially the common “alot” and “a lot”. I write alot of articles… i’m thinking it’s time for me to proofread my work lol. Hi Victor, “alot” does not exist, “allot” does. A lot can mean many things other than many; an item for sale at an auction; a piece of land, a parking space etc. Hi Michelle, the classic use of the comma is in the title of the book Eats, shoots and leaves by Lynne Truss. Thus, “A woman, without her man, is nothing.” Without the two commas you could just say “A woman is nothing without her man.” I think Penny has been very clever in constructing this sentence and using the alternative punctuation. The AP Stylebook would differ about the commas and presumably recommend a clearer phrasing of the statement as in my example above but this is to miss the point that Penny makes of how you han transform a sentence just with punctuation. Please allow me to take the following as an example phrase, written in US-English. I have been made aware that book publishers don’t like (;) if overused. Hence I try to arrange my dialogue to fit with a comma. “Ok,” the voice said, “We must assume the pursuer is still close by. Don’t go back to Tokyo until we speak again in twenty-four hours.” There was a click. No commas are necessary in “A woman without her man is nothing,” because it its essential to the meaning of the sentence. Perhaps I can offer a clearer example of what I mean as far as essential and non-essential phrases. The phrase “with the Russian surname” is essential to the meaning of the sentence. It identifies which student (from all other students)we are talking about, namely, the one with the Russian surname. Therefore, no commas are necessary. If we set the phrase “with the Russian surname” in commas, we are indicating that it is not essential to the meaning of the sentence, meaning, we can remove it from the sentence and the meaning would not be compromised. So, we are left with “The student aced the history test.” Which student, then? The student with the Russian surname aced the history test.” It confirms my thoughts with: “A woman is nothing without her man.” Both examples clearly define an essential sentence. Thank you. I enjoy the blog. The improper use of punctuation, commas can change the meaning definitely. This is so good to learn..importantly for writers starting their journey in EzineArticles importantly. This is an extremely helpful, informative, interesting, and educational article explaining the correct use of punctuation when writing American English. I don’t know how others feel, but to obtain the full benefit I will need to read it many times. Great article and PDF. I think of Alfred Hitchcock and his advice to actors – something about being aware of the “dog’s feet”. He said this to emphasize that pause was often crucial. I find with punctuation, reading aloud is the key. I just love IPIA comment; reading aloud does it for me too. Wishing all that can read and write best wishes for the new year as journey of journeys unfolds and shapes who we are. These tips are very handy. Most of them I already knew, but there were a few ones that were new to me. So what is the correct way around this problem? Yes, Shalk. The use of the apostrophe you gave as an example can definitely be confusing, and its correct usage is apparently debatable amongst writers. The general consensus for your example, “the 4U’s,” appears to be that no apostrophe is necessary with uncommon plurals of capitalized letters and numbers. So, plural forms such as “the 4Us” or “the 1990s” are apostrophe free! (Also see Purdue Owl Online Writing Lab). However, with regard to uncommon plural use in phrases or expressions (“mind your p’s and q’s” or “no if’s, and’s, or but’s”), many agree to use apostrophes to avoid confusion to the reader. Still, for the writer who can’t commit one way or another, using quotes or italics to bring attention to the uncommon plural form can also help to circumvent confusion to the reader.